Alabama 56 Louisiana 14 – I don’t know why Alabama calls its mascot The Crimson Tide. They should call it The Crimson Tsunami. Nevertheless the Cajuns could not get it raging against as the Tide rolled over them. I award Nick Saban and the team The Steam Roller Award. West Virginia 42 Texas Tech 34 – The Almost Heaven; Burning Couches Award goes to the West Virginia Mountaineers. I so love it when Tech loses. OU 66 Baylor 33 – The Award for Just Showing Up goes to Baylor. Obviously, Murry and the Sooners were not looking ahead. Texas 19 K-State 14 – Really? A good away win, but it is still Kansas State. I award the Horns of THE University of Texas the Remember There Are Four Quarters to Play trophy. This will not hook em in Dallas next weekend. Florida 13 Mississippi State 6 – Chomp! To the Bulldogs of State I give you The Calendar Award. Women’s basketball season starts soon. LSU 45 Ole Miss 16 – I award the Tigers of LSU The Cake Award. That victory was a piece of cake. I would also like to award the Ole Miss Coach the Ugly Coaching Outfit Award. That large of a shade of red rain gear took up a large portion of my screen. Notre Dame 38 Stanford 17 – The Not Close and No Cigar Award goes to Stanford. When did Notre Dame take mustard as one of its colors? What is the color of the ND called? Metallic Mustard? Those looked radioactive. Award to ND – Ugly Uniforms. The release of several bodily fluids that accompany fits of anger and disbelief. The Dreaded Threaded Incline Plane Award – Screwed. 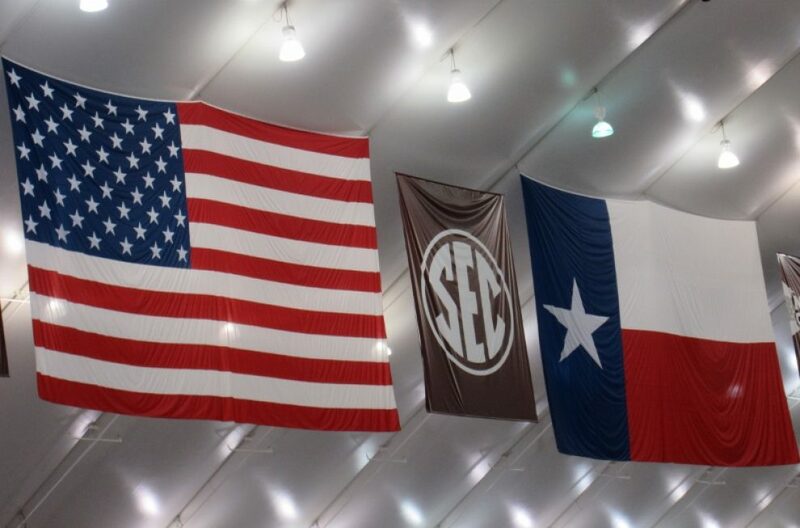 Texas A&M 24 – Arkansas 17 – Also receiving multiple awards are The Aggies. First we have the Pig Sty Award. That performance looked awful. I don’t want to be singing “We are the same Aggies; the same Aggies are we.” I was not happy. The final award goes to Arkansas for the inflatable mascot. Worst Representation of Something. That is just wrong. As if the hog head hat was not enough now there is a mascot with a turd tail.